With summertime approaching, the family schedule can get pretty packed with fun-filled activities. Whether it’s a road trip, sports camps, or just family outings, it is important to plan ahead to ensure that we aren’t making snack-time an afterthought. We’ve compiled a list of foods that we think would be great additions to the summer grocery list. Warmer weather is here so it’s important that we keep our kids well hydrated and keep the body well balanced. Water is the best fluid to make sure that the little ones are quenched and should be the beverage of choice. When the family is on the go, grab a bottle of water instead of a juice box or sports drink. Drinking fluoridated water can help fight against acidic foods that can potentially wreak havoc on the teeth. 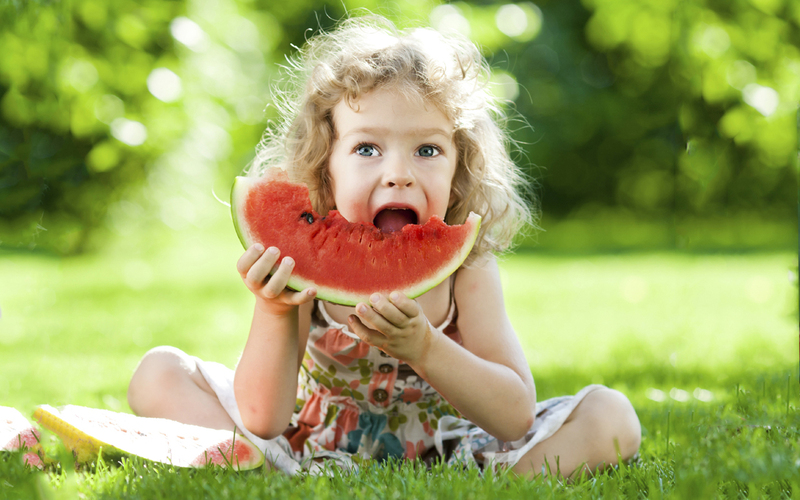 Fruits and veggies are the perfect bite-size snacks for children. Parents can make it fun and exciting by allowing kids to choose which items from the produce section they would like. Carrots, strawberries, apples, grapes, celery…the more colors the better! Pack the fruits and veggies ahead of time in snack baggies and keep handy in the refrigerator for quick, on-the-go grabs. Nuts can serve as a natural defense against acids that can lead to cavities, clearing the teeth of debris and promoting saliva production. High in protein, nuts can be a great alternative to the crunch, salty chips kids may crave. Get out there and enjoy everything that summer brings…and snack well!